Patrick Stump has had a big falling out with Fall Out Boy. 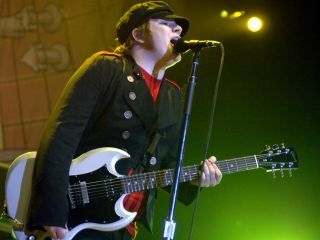 The guitarist-singer for the Chicago-based quartet, responding to rumors of dissension in their ranks, said yesterday, "I'm not in Fall Boy Boy right now." Only last November, FOB bassist-lyricist Pete Wentz told MusicRadar that the group weren't breaking up, but were merely taking a hiatus. "We've been doing this for seven or eight years, and we need a break." Stump, who has been writing with and producing other artists, told Spin that Fall Out Boy's current status mirrored that of Aerosmith's. "One way or another, the band will always be around," he said. "Steven Tyler isn't in Aerosmith anymore, but his gravestone will probably say something about Aerosmith. Whether we play again or not, I don't know. If we do, it will be for the right reasons. If we don't, it will also be for the right reasons." "I'm not in Fall Boy Boy right now" singer Patrick Stump, to which drummer Andy Hurley responded, "I quit too." Shortly after Stump made those comments, drummer Andy Hurley Tweeted "I quit too." He promptly elaborated, writing that "I didn't really quit, by the way. Everything is being blown way out of proportion." Later, Hurley wrote, "I'll still be touring the world, somehow, someway. [I] don't have any light to shed. I don't know what's going to happen. I feel it will be ok in the end, but I don't know. Honestly." FOB guitarist Joe Trohman, who working on a metal project with Hurley and Anthrax's Scott Ian, responded to Stump's comments on his Twitter account (these guys love their Tweets) by saying, "I just did interviews with Span Magazine, Rabbling Stone and Blunder about how much quitting I done." Ouch! Wentz, appearing to have the last word (at least for now), took to the the band's website and posted a picture of the group in happier times, embracing one another in a roadside convenience with the wistful caption: "I miss truck stops and sneaking nachos."